Next time anyone says "We're praying to god for ______", the obvious response must be "Yea how'd that work out for the Notre Dame? What makes you more special?" Taking religion out of the equation, it's a significant historical loss, and while virtually everything in the universe could be considered ephemeral, I would not have expected this for centuries more. Couldn't get his hump into the water tanker's pilot's seat. I'm sure most of us being human can think of iconic structures we'd hate to lose. I know it will be rebuilt, but a damn shame for something that has survived so long. Imagine if the Pyramids suddenly fell into a less pyramidy shape? Very sad loss. I was just there (in Paris) with my family last summer. I'm glad my boys were able to see ND before this happened. That being said, I imagine this event will be a catalyst for the much need renovation of the cathedral. It has has deteriorated quite a bit recently and is in desperate need of maintenance. That being said, I imagine this event will be a catalyst for the much need renovation of the cathedral. It has has deteriorated quite a bit recently and is in desperate need of maintenance. Yesterday I heard about a fire in the basement of St. John the Divine in NYC, odd coincidence. 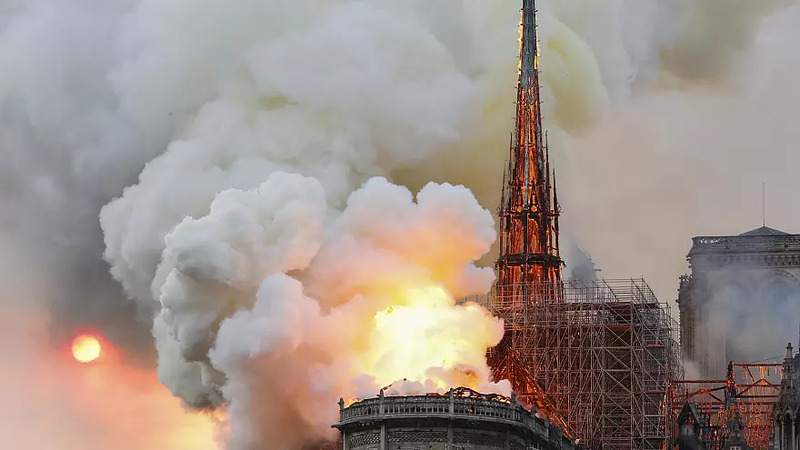 At least this isn't terrorism, but in a way it makes it more frustrating, because you'd think the renovation work was being done carefully enough to avoid this tragedy. Truly heartbreaking. As for raising money for its renovation, wtf is the point of the vatican's immense riches?! They could sell a few paintings and cover the billions needed to renovate, or is this their way of getting insurance to cover the cost? I'm going with 'gOD is MAD" ...AS HELL! That dumb POS should had told us sooner. But they will. Even though it is no longer part of the modern church (and not just Catholic) some still have a notion of buying your way unto God. I always liked the book and movie "Shoes Of The Fisherman" but those were only a book and a movie. It's all other people's money... money given to them by morons. The pope is basically Jim Bakker on steroids. U people are cruel. For some of us, the sinking of the Titanic (anniversary today) or the Peloponnesian war are still fresh wounds. At least there are no deaths reported at this hour. the Vatican could sell off a minute fraction of its wealth and cure all kinds of ills in the world. but, they'll squeeze the 'faithful' for a lot of money to rebuild the Cathedral...and skim off a nice chunk of change in the process. visited that church once. Maybe they will rebuild it as Paris has little left from before the 2nd Empire (not a bad thing) like this church. If I believed in karma and fairies I would say this burning is penance for the church's crusade against the Albigensians in the 13th century (a million person religious genocide). But it's a pretty and interesting building and a lot of water has gone under the bridge. what a waste of money. It was God's will to have it burnt down. something about building false idols and such sh!t. Just move on and let the Catholics buy their own properties. Excepting that the structure itself is a work of art. The Rose windows are beautiful and there’s no info yet on if they were damaged. Same with the gargoyles. Some of the most moving images Ive seen tonight are of the people of Paris, young and old, kneeling and praying. They recognize the importance of this building in their history and cultural. these things happen whether by design or circumstance. and stuff does get rebuilt. in any case, an iconic building in an iconic city.